Love, Lust, Faith and Dreams (stylized as LOVE LUST FAITH + DREAMS) is the fourth studio album by American rock band Thirty Seconds to Mars, released through Virgin Records on May 21, 2013. It is their first album in four years, following This Is War (2009), as well as their last album released through Virgin. The record carries the concept album format of This Is War and expands the spectrum to revolve around the themes after which it is named. Its sound follows the experimental direction found on some of the band's previous work, incorporating elements of art rock and electronic music. The album was promoted with three singles, "Up in the Air", "Do or Die", and "City of Angels", two of which managed to chart within the top ten on the US Alternative Songs chart. Upon release, the album was well received by critics, who called it a return to form for the band. It was the group's second consecutive nomination for the Echo Music Prize. The album debuted at number 6 on the Billboard 200, becoming the band's first top ten album on the chart, and reached the top ten in more than fifteen countries, including the United Kingdom, Canada, Australia, and Germany. In 2009, Thirty Seconds to Mars released their third studio album This Is War. The album saw a new direction taken by the band, employing darker lyrical themes, a louder sound and "much more electronic and experimental, with lots of vintage synths." This Is War has since sold over four million albums and one million singles solicited from the album worldwide, making the album the band's most commercially successful so far. The tour that followed, the Into the Wild Tour, Hurricane Tour and Closer to the Edge Tour, spanned two years and broke the Guinness World Record for the "Longest Concert Tour by a Rock Band", playing a total of 309 shows. To follow up This Is War, the band began to work on their fourth studio album immediately after the conclusion of the Closer to the Edge Tour. Frontman Jared Leto wanted "an album that has ebb and flow and content and structure. ", a sharp contrast to the band's previous work. Leto began writing for the album in December 2011, and by the time the band started the recording sessions for Love, Lust, Faith and Dreams in April 2012, he had amassed a total of 50 songs. On April 23, 2012, Rolling Stone released an article revealing that Thirty Seconds to Mars was currently in the studio recording a fourth LP. According to the article, the band previewed some of the new material in their April 27 VyRT stream, including a song called "Witness". It also stated that they were interested in working with other artists for the album. The band's official Twitter account confirmed this news. On April 25, 2012 MTV Buzzworthy confirmed that they are working with famed record producer Steve Lillywhite, who had previously worked with U2, Peter Gabriel, and The Killers, among others. The recording sessions for Love, Lust, Faith + Dreams took place from April to December 2012, at the Laboratory in Los Angeles, U.S.A. In September 2012, "The Summit", an event where fans are invited to contribute chorus vocals to tracks on the album and previously held to record choral vocals for This Is War in 2009, was held. Unlike This Is War, where an entire audience-sized crowd took part in the recording, the summit that took place for the recording of Love, Lust Faith and Dreams was more stripped-down and organic, with only 20 to 25 people contributing vocals to the record. All four of the introductions, as heard in Love, Lust, Faith and Dreams. Love, Lust, Faith and Dreams is a concept album revolving around the themes after which the album is named. The album is divided into four segments, each named Love, Lust, Faith and Dreams, respectively, with the beginning of each segment declared by a female voice proclaiming the name of the segment before the beginning of a song or at the end of an interlude which introduces the next segment of the album. A more specific album concept can be seen inside the CD. It is recognized by four colors, with the color red standing for Love, yellow for Lust, green for Faith, and blue for Dreams. LOVE contains "Birth" and "Conquistador". LUST contains "Up in the Air", "City of Angels", "The Race", "End of All Days" and "Pyres of Varanasi". FAITH contains "Bright Lights", "Do or Die" and "Convergence". DREAMS contains "Northern Lights", and "Depuis Le Début". Stylistically, Love, Lust, Faith and Dreams has been described as experimental rock, electronic rock, and art rock. The artwork for Love, Lust, Faith and Dreams features Damien Hirst's 2011 gloss-on-canvas work, entitled "Isonicotinic Acid Ethyl Ester". The painting is part of Hirst's spot painting series. It has also been announced that a second piece of artwork from Hirst, a signwriting-on-canvas piece entitled "Monochromatic Sectors from Primary, Secondary & Tertiary Colour Ring, Dark Centre" will appear inside the booklet of the Compact Disc version of the album. This art is actually featured on the CD itself. A CD copy of "Up in the Air" was sent to the International Space Station aboard SpaceX CRS-2. Early promotion for the album during its latter recording stages were two programs on the online premium Streaming media website VyRT, a service which was founded by the band themselves in the latter stages of the This Is War album cycle. The two programs, The Mars Laboratory and The Mars Laboratory II showed members of VyRT an insight into the band's activity during the recording of the album and also debuted acoustic versions of brand new songs from Love, Lust, Faith and Dreams. The Mars Laboratory aired on April 27, 2012 while The Mars Laboratory II aired during post-production of the album on December 1, 2012. On May 2, 2013, the band's Twitter hashtag, "#MARSmay21st", successfully reached the worldwide trending hashtags on the social platform. As a way of saying thanks to their fans, the band released the lyric video for "Conquistador" on Vevo the same day, two weeks before the album's release. "Up in the Air" was released as the lead single from Love, Lust, Faith and Dreams on March 19, 2013. It was announced it would be the first single from the new album on February 28 via Twitter. A CD copy of the single was sent to NASA and SpaceX for launch aboard the Dragon spacecraft on SpaceX CRS-2. The mission was launched atop a Falcon 9 rocket on March 1, 2013, sending the first ever commercial copy of music into space. The spacecraft berthed and docked with the International Space Station on March 3, 2013, making the single available to play by the Expedition 35 crew aboard the station. The song made its worldwide debut aboard the station on March 18, 2013 and was released as a Digital download single on iTunes the next day. The music video was released on April 19, 2013 worldwide on Vevo. "City of Angels" was sent to US Modern rock radio as a promotional single from Love, Lust, Faith and Dreams on July 23, 2013. A music video for "City of Angels", featuring Bartholomew Cubbins as director, was released onto YouTube on October 29, 2013. It was shot over two days on August 18 and 19, 2013, in Los Angeles, California. Despite not being released as an official single, "Conquistador" was used in a trailer promoting the upcoming video game WWE 2K14. "Do or Die" was released as a promotional single from Love, Lust, Faith and Dreams on September 9, 2013 in Europe. During the Summer European Tour, Jared confirmed the band was recording footage for a live video for the song. The music video was released on August 5, 2013 worldwide on Vevo. Love, Lust, Faith and Dreams received generally positive reviews from music critics. At Metacritic, which assigns a normalized rating out of 100 to reviews from mainstream critics, the album received an average score of 62, based on 11 reviews. Emily Zemler from Billboard praised the stylistic variety and experimentation, writing that the album "invests itself fully and artfully in its own vision" infused with "an even fuller sense of grandeur than heard on past releases", and "offers an opportunity to explore the boundaries of rock". AllMusic senior editor Stephen Thomas Erlewine acknowledged the band's musical adventurousness, describing the record as "galvanized for the present, pushing its thick processed guitars, chanted choruses, and clanging keyboards to the forefront, flirting with taboos underneath its shining surface". He felt that the group's "loosening of their stylistic confines" results in their "boldest, brightest, most imaginative record". Andy Ritchie of Rock Sound complimented Jared Leto's vocal performance and the group's musicianship, praising the "massive choruses" and "titanic climaxes," and stated that the album reaffirms that Thirty Seconds to Mars is in a class of its own. In a four-and-a-half star review, Ryan Jones of Alternative Addiction commended the album's lyrical content and musical style, calling the new sounds "deep and plush", and wrote that the "entire record feels like an amazing journey". Ian Winwood, writing for Kerrang!, found the album "lavish but not cloying, expansive yet often economical, approachable without being familiar", calling it a "release that defies genre" and deeming it as a "grand achievement befitting this most grandiose of bands". Kyle Anderson of Entertainment Weekly gave the record an "A–", writing that it displays "throbbing modern-rock anthems" which "offer visceral, hands-up hedonism", although he found the album's narrative inexplicable. Dan Slessor of Alternative Press commended the band's capacity for writing "titanic choruses full of sweeping drama in a manner that is almost untouchable", but felt that with "shorter songs and more restrained production" the album lacks the "epic quality" of its predecessor This Is War. In his review for Sound & Vision, Ken Richardson noticed the band's ambition and commended the album's concept. Brent Faulkner of PopMatters gave a mixed response, stating that the album has "its finer moments as well as moments that are overwrought, overextended, and overproduced". Q magazine found it "empty in the extreme", while Uncut called it "wildly overcooked and deeply derivative". John Watt from Drowned in Sound wrote that the album "is a disappointingly tepid affair". Andy Baber of musicOMH felt that the record descends into "something of a mess" despite "starting with what sounded like a clear direction". Love, Lust, Faith and Dreams was named one of the best albums of 2013 by a number of publications, including Alternative Addiction (number two), Melodic (no order), and Under the Radar (number six). It was ranked as the best album of the year by The Scene Magazine, with critic Shayla Miller writing, "This album’s flow is top-notch, making it quite a neat experience. It’s meant to be listened to as a whole. It is a complete piece of music, and it’s breathtaking." The singles "Up in the Air", "Do or Die", and "City of Angels" were included in 91X's year-end top songs list at number 44, 39 and 33, respectively. Love, Lust, Faith and Dreams received a nomination in the category of Best International Rock/Alternative at the 2014 Echo Awards, but lost to Outlaw Gentlemen & Shady Ladies by Volbeat. It was the band's second consecutive nomination for the Echo Music Prize. Love, Lust, Faith and Dreams was nominated for Best Album at the 2014 World Music Awards, but lost to Coup d'Etat by G-Dragon. The album also earned the band the MTV Europe Music Award for Best Alternative in two consecutive years in 2013 and 2014. In the United States, Love, Lust, Faith and Dreams debuted at number six on the Billboard 200, selling 53,000 copies in its first week of release according to Nielsen SoundScan. It became the band's first album to reach the top ten of the chart and was also their second-largest sales week in the nation, behind their 2009 album This Is War which opened with 69,000 copies. The album entered both the Billboard's Alternative Albums and Rock Albums charts at number three. It also debuted at number six on the magazine's Tastemaker Albums. In March 2014, it re-entered the Billboard 200 at number 25 with sales of over 186,000 copies, following a promotion by the iTunes Store. By the end of 2013, Love, Lust, Faith and Dreams was included among the best-selling rock albums of the year. In the United Kingdom, Love, Lust, Faith and Dreams entered the national albums chart at number five and debuted at the top spot of the UK Rock Chart. During its first week, the songs "Conquistador" and "City of Angels" appeared in lower regions of the rock chart due to strong digital sales from the album. In December 2013, Love, Lust, Faith and Dreams was certified silver by the British Phonographic Industry (BPI) for shipments of 60,000 units in the country. In Australia, the album entered the ARIA Charts at number four with first week sales of 4,814 copies. In Russia, it debuted at number five, earning a gold certification in its first week of sales. In Portugal, Love, Lust, Faith and Dreams debuted at number three behind Daft Punk's Random Access Memories and The National's Trouble Will Find Me. After fluctuating down the chart, the album reached the top spot on the issue dated July 15, 2013 and was certified two-times platinum by the Associação Fonográfica Portuguesa (AFP), with sales of over 40,000 copies. In Germany, the album debuted at number three and has since been certified gold by the Bundesverband Musikindustrie (BVMI), denoting shipments of over 100,000 units throughout the country. 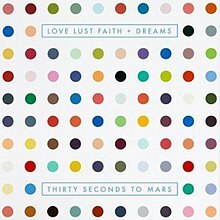 Love, Lust, Faith and Dreams also reached the top ten in Austria, Italy, Poland, Switzerland, Canada, Finland, Norway, Spain, Czech Republic, Estonia, and Ireland. All tracks written by Jared Leto, except where noted. Credits adapted from Love, Lust, Faith and Dreams album liner notes. ^ Montgomery, James. "Thirty Seconds to Mars Get Deep, Dirty On This Is War". MTV. Retrieved 2009-12-16. ^ Harris, Chris. "Thirty Seconds to Mars Sing About Survival on "This Is War"". Rolling Stone. Retrieved 16 December 2009. ^ "30 Seconds to Mars Wins Guinness World Record For Longest Concert Tour By a Rock Band". Perez Hilton. Retrieved December 13, 2011. ^ "In terms of creativity... I made an album..." Thirty Seconds to Mars. Facebook. Retrieved 29 March 2013. ^ Baltin, Steve. "Thirty Seconds to Mars Pause Touring to Record New LP". Music. Rolling Stone. Retrieved 29 March 2013. ^ Jenna, Rubenstein. "MTV Buzzworthy: Thirty Seconds To Mars to Release Fourth Album". This Is The Hive.net. Retrieved 2012-04-25. ^ "SUMMIT IN THE LAB". Instagram Photos. Facebook. Retrieved 29 March 2013. ^ "ThirtySecondsToMars - Love, Lust, Faith + Dreams". 30stmuk.com. Retrieved 2013-05-24. ^ a b c Zemler, Emily (May 21, 2013). "Thirty Seconds To Mars, 'Love Lust Faith + Dreams': Track-By-Track Review". Billboard. Retrieved May 29, 2013. ^ Montgomery, James (May 21, 2013). "Thirty Seconds To Mars Set To 'Unleash The Beast' On Love Lust Faith + Dreams". MTV News. Viacom Media Networks. Retrieved April 4, 2018. ^ Yadav, Dylan (April 5, 2018). "Thirty Seconds To Mars Captures The Essence Of Today In 'America'". Immortal Reviews. Retrieved April 8, 2018. ^ "View Now- Damien Hirst's spot paintings and "Joy colour"". Archived from the original on 24 March 2013. Retrieved 18 March 2013. ^ "LOVE LUST FAITH + DREAMS". Thirty Seconds to Mars. Archived from the original on 21 March 2013. Retrieved 18 March 2013. ^ "The Mars Laboratory". VyRT. Thirty Seconds to Mars. Retrieved 28 March 2013. ^ "VyRT: THE MARS LAB II — THE FINAL LAB". thirtysecondstomars.thisisthehive.net. EMI, Virgin records. Retrieved 28 March 2013. ^ "Thirty Seconds To Mars - Conquistador (Lyric Video)". YouTube. Retrieved 2013-05-24. ^ "Thirty Seconds to Mars To Release New Single And You Can't Hear It". Bloody Disgusting. Retrieved 1 March 2013. ^ "Thirty Seconds to Mars Launching New Single Into Space". Rolling Stone. Retrieved 1 March 2013. ^ "Video Premiere: Thirty Seconds To Mars, "Up In The Air" teaser - SHANNON - Alternative Press". Altpress.com. 2013-04-13. Retrieved 2013-05-24. ^ "Alternative Future Releases". All Access Media Group. Archived from the original on 2013-06-29. ^ a b Erlewine, Stephen Thomas. "Love Lust Faith + Dreams – Thirty Seconds to Mars". AllMusic. All Media Network. Retrieved May 29, 2013. ^ a b Slessor, Dan (May 21, 2013). "Thirty Seconds to Mars – Love Lust Faith + Dreams". Alternative Press. Retrieved May 29, 2013. ^ a b Anderson, Kyle (May 24, 2013). "Love Lust Faith + Dreams". Entertainment Weekly (1260): 83. Retrieved October 2, 2014. ^ a b Winwood, Ian (May 11, 2013). "Love Lust Faith + Dreams". Kerrang! (1465): 52. ^ a b Faulkner, Brent (May 22, 2013). "Thirty Seconds to Mars: Love Lust Faith + Dreams". PopMatters. Retrieved May 29, 2013. ^ a b "Love Lust Faith + Dreams". Q: 111. July 2013. ^ a b Ritchie, Andy (June 2013). "Love Lust Faith + Dreams". Rock Sound (174): 79. ^ a b Richardson, Ken (August 2013). "Love Lust Faith + Dreams". Sound & Vision. 78 (4): 73. ^ a b "Love Lust Faith + Dreams". Uncut: 79. June 2013. ^ Boise, Danielle (September 30, 2013). "Thirty Seconds to Mars Kicked off Love, Lust, Faith + Dreams Tour at the Tabernacle on September 27". Target Audience. Retrieved April 8, 2017. ^ Hurst, Phoebe (March 4, 2014). "Thirty Seconds To Mars: We Have Lift Off". Scenestr. Eyeball Media Enterprises. Retrieved April 8, 2017. ^ "Reviews for Love Lust Faith + Dreams". Metacritic. CBS Interactive. Retrieved August 28, 2014. ^ Jones, Ryan (May 22, 2013). "Review of "Love Lust Faith + Dreams" by Thirty Seconds to Mars". Alternative Addiction. Archived from the original on October 6, 2014. Retrieved October 3, 2014. ^ Watt, John (May 17, 2013). "Album Review: Thirty Seconds to Mars - Love Lust Faith + Dreams". Drowned in Sound. Retrieved October 3, 2014. ^ Baber, Andy (May 20, 2013). "Thirty Seconds to Mars – Love Lust Faith + Dreams". musicOMH. Retrieved October 3, 2014. ^ "Top 10 Albums of 2013". Alternative Addiction. Archived from the original on October 14, 2013. Retrieved October 22, 2016. ^ "Best of 2013". Melodic. Retrieved October 22, 2016. ^ "Top 10 Albums of 2013". Under the Radar. March 8, 2014. Retrieved October 22, 2016. ^ Miller, Shayla (December 30, 2013). "Top 10 albums of 2013". The Scene Magazine. Retrieved October 22, 2016. ^ "Top 91 of 2013". 91X. Local Media San Diego. February 10, 2015. ^ "Top 91 of 2014". 91X. Local Media San Diego. February 10, 2015. ^ Roxborough, Scott (March 27, 2014). "German Echo Music Awards: Avicii, Eminem, Depeche Mode Big Winners". The Hollywood Reporter. Retrieved October 22, 2016. ^ Spahr, Wolfgang (March 10, 2011). "Adele, Bruno Mars, Black Eyed Peas Among Nominees for Germany's Echo Awards". Billboard. Retrieved October 22, 2016. ^ "World's Best Album". World Music Awards. Archived from the original on February 5, 2014. Retrieved October 22, 2016. ^ Ross, Philip (November 10, 2013). "2013 MTV EMAs Winners: Miley Cyrus, Eminem, Beyoncé Honored At Europe Music Awards In Amsterdam". International Business Times. Retrieved October 22, 2016. ^ Walker, John (November 10, 2014). "Jared Leto Surprises His 30STM Bandmates with a Best Alternative EMA". MTV. Viacom Media Networks. Retrieved October 22, 2016. ^ Caulfield, Keith (May 29, 2013). "Daft Punk Leads Debut-Filled Top Four on Billboard 200 Album Chart". Billboard. Retrieved October 22, 2016. ^ a b "Thirty Seconds to Mars Chart History (Top Alternative Albums)". Billboard. Retrieved May 31, 2013. ^ a b "Thirty Seconds to Mars Chart History (Top Rock Albums)". Billboard. Retrieved May 31, 2013. ^ "Tastemakers: Love Lust Faith + Dreams". Billboard. Retrieved April 8, 2017. ^ Caulfield, Keith (March 14, 2014). "Chart Moves: Thirty Seconds to Mars Makes Post-Oscar Gain, Von Trapp Singers Debut on Billboard 200". Billboard. Retrieved October 22, 2016. ^ Caulfield, Keith (September 12, 2014). "Billboard 200 Chart Moves: 'Guardians' & 'Frozen' Make Up Almost 40% of 2014 Soundtrack Sales". Billboard. Retrieved October 22, 2016. ^ a b "Rock Albums: Year End 2013". Billboard. Retrieved May 21, 2016. ^ Lane, Dan (May 26, 2013). "Daft Punk score first UK Number 1 album with Random Access Memories". Official Charts Company. Retrieved April 6, 2017. ^ a b "Rock & Metal Albums Top 40 - 1st June 2013". Official Charts Company. Retrieved May 28, 2013. ^ "Top 40 Rock & Metal Singles – 1st June 2013". Official Charts Company. Retrieved December 2, 2013. ^ a b "British album certifications – Thirty Seconds to Mars – Love Lust Faith + Dreams". British Phonographic Industry. Select albums in the Format field. Select Silver in the Certification field. Type Love Lust Faith + Dreams in the "Search BPI Awards" field and then press Enter. ^ Cashmere, Paul (May 26, 2013). "Daft Punk Random Access Memories Becomes Fastest Selling Album of 2013 in Australia". Noise11. Retrieved October 22, 2016. ^ "Daft Punk и "Великий Гэтсби" покорили российский iTunes" (in Russian). Lenta.ru. May 27, 2013. Retrieved May 28, 2013. ^ "Portuguese Albums Chart: 21.2013". Hung Medien. Retrieved April 6, 2017. ^ a b "Top Oficial AFP: Top 30 Artistas – Semana 29 de 2013" (in Portuguese). Artistas-espectaculos.com. Associação Fonográfica Portuguesa. Archived from the original on July 29, 2013. Retrieved July 29, 2013. ^ a b "Longplay-Chartverfolgung at Musicline" (in German). Musicline.de. Phononet GmbH. Retrieved May 31, 2013. ^ a b "Gold-/Platin-Datenbank (Thirty Seconds to Mars; 'Love Lust Faith + Dreams')" (in German). Bundesverband Musikindustrie. Retrieved May 29, 2015. ^ a b "Ultratop.be – Thirty Seconds To Mars – Love Lust Faith + Dreams" (in Dutch). Hung Medien. Retrieved May 31, 2013. ^ "Australiancharts.com – Thirty Seconds To Mars – Love Lust Faith + Dreams". Hung Medien. Retrieved May 31, 2013. ^ "Austriancharts.at – Thirty Seconds To Mars – Love Lust Faith + Dreams" (in German). Hung Medien. Retrieved May 31, 2013. ^ "Ultratop.be – Thirty Seconds To Mars – Love Lust Faith + Dreams" (in French). Hung Medien. Retrieved May 31, 2013. ^ "Thirty Seconds to Mars Chart History (Canadian Albums)". Billboard. Retrieved May 31, 2013. ^ "ČNS IFPI – TOP 100 – Love Lust Faith + Dreams" (in Czech). IFPI Czech Republic. Retrieved May 31, 2013. ^ "Danishcharts.dk – Thirty Seconds To Mars – Love Lust Faith + Dreams". Hung Medien. Retrieved May 31, 2013. ^ "Dutchcharts.nl – Thirty Seconds To Mars – Love Lust Faith + Dreams" (in Dutch). Hung Medien. Retrieved May 31, 2013. ^ "R2 Eesti müügitabel, nädal 34/2013" (in Estonian). Eesti Rahvusringhääling. Archived from the original on March 10, 2014. Retrieved May 21, 2016. ^ "Thirty Seconds To Mars: Love Lust Faith + Dreams" (in Finnish). Musiikkituottajat – IFPI Finland. Retrieved May 31, 2013. ^ "Lescharts.com – Thirty Seconds To Mars – Love Lust Faith + Dreams". Hung Medien. Retrieved May 31, 2013. ^ "Top-75 Albums Sales Chart Week: 29/2013". IFPI Greece. Archived from the original on July 30, 2013. Retrieved July 30, 2013. ^ "Top 40 album DVD és válogatáslemez-lista – 2013. 22. hét" (in Hungarian). MAHASZ. Retrieved June 5, 2013. ^ "GFK Chart-Track Albums: Week 21, 2013". Chart-Track. IRMA. Retrieved May 31, 2013. ^ "Italiancharts.com – Thirty Seconds To Mars – Love Lust Faith + Dreams". Hung Medien. Retrieved May 31, 2013. ^ "Love Lust Faith + Dreams". Oricon. Retrieved May 31, 2013. ^ "South Korea Gaon Album Chart". On the page, select "2013-05-19~2013-05-25" to obtain the corresponding chart. Gaon Chart Retrieved May 31, 2013. ^ "Charts.org.nz – Thirty Seconds To Mars – Love Lust Faith + Dreams". Hung Medien. Retrieved May 31, 2013. ^ "Norwegiancharts.com – Thirty Seconds To Mars – Love Lust Faith + Dreams". Hung Medien. Retrieved May 31, 2013. ^ "Oficjalna lista sprzedaży :: OLiS - Official Retail Sales Chart". OLiS. Polish Society of the Phonographic Industry. Retrieved May 31, 2013. ^ "Portuguesecharts.com – Thirty Seconds To Mars – Love Lust Faith + Dreams". Hung Medien. Retrieved 27 July 2013. ^ "Григорий Лепс утратил лидерство в российском чарте iTunes" (in Russian). Lenta.ru. March 24, 2014. Retrieved August 19, 2017. ^ "Official Scottish Albums Chart Top 100". Official Charts Company. Retrieved May 31, 2013. ^ "Čarobnice iz glasbene skrinje Vlada Kreslina" (in Slovenian). RTV SLO. May 31, 2013. Retrieved May 31, 2013. ^ "Spanishcharts.com – Thirty Seconds To Mars – Love Lust Faith + Dreams". Hung Medien. Retrieved May 31, 2013. ^ "Swedishcharts.com – Thirty Seconds To Mars – Love Lust Faith + Dreams". Hung Medien. Retrieved May 31, 2013. ^ "Swisscharts.com – Thirty Seconds To Mars – Love Lust Faith + Dreams". Hung Medien. Retrieved May 31, 2013. ^ "Thirty Seconds to Mars | Artist | Official Charts". UK Albums Chart. Retrieved May 31, 2013. ^ "Thirty Seconds to Mars Chart History (Billboard 200)". Billboard. Retrieved May 31, 2013. ^ "Jahreshitparade Alben 2013" (in German). Hung Medien. Retrieved May 10, 2015. ^ "Jaaroverzichten 2013 – Albums" (in Dutch). Hung Medien. Retrieved December 29, 2013. ^ "Rapports Annuels 2013 – Albums" (in French). Hung Medien. Retrieved December 29, 2013. ^ "Top 100 Album-Jahrescharts – 2013" (in German). GfK Entertainment. Retrieved June 18, 2015. ^ "Classifiche annuali 2013 Top of the Music by FIMI GfK" (in Italian). Federazione Industria Musicale Italiana. January 7, 2014. Retrieved May 10, 2015. ^ "Portuguese National Top 50 – 2013". Blitz (in Portuguese): 67. January 2014. ^ "End of Year Charts: 2013" (PDF). UKChartsPlus. Retrieved May 21, 2016. ^ "Austrian album certifications – Thirty Seconds to Mars – Love Lust Faith + Dreams" (in German). IFPI Austria. Retrieved July 20, 2013. Enter Thirty Seconds to Mars in the field Interpret. Enter Love Lust Faith + Dreams in the field Titel. Select album in the field Format. Click Suchen. ^ "Thirty Seconds to Mars na América Latina". Billboard Brasil (in Portuguese): 32. October 17, 2014. ^ "Italian album certifications – Thirty Seconds to Mars – Love Lust Faith + Dreams" (in Italian). Federazione Industria Musicale Italiana. Retrieved April 6, 2017. Select "Tutti gli anni" in the "Anno" drop-down menu. Select "Love Lust Faith + Dreams" in the "Filtra" field. Select "Album e Compilation" under "Sezione". ^ "Polish album certifications – Thirty Seconds to Mars – Love Lust Faith + Dreams" (in Polish). Polish Society of the Phonographic Industry. Retrieved May 29, 2015. ^ Turcu, Ioana. "Thirty Seconds to Mars, discul de aur pentru vanzari in Romania" (in Romanian). BestMusic.ro. Retrieved July 6, 2014. ^ a b Domyan-Mudie, Dionne (March 19, 2014). "Climbing up Stages in SA Once Again". Sandton Chronicle: 68. ^ "Mars Attacks". Hits. July 27, 2016. Retrieved April 20, 2017.